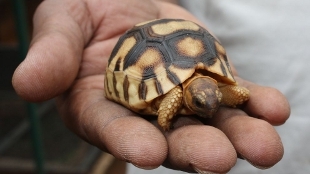 Two baby ploughshare tortoises born to parents raised in a captive breeding program are discovered in Madagascar, validating the conservation effort. As few as 500 adult ploughshare tortoises roam the bamboo scrub of Baly Bay in north-western Madagascar. Fortunately, many others are thriving in the Durrell Wildlife Conservation Trust’s captive breeding colony. Since 1998, 65 sub-adult tortoises have been reintroduced into the wild. And now, a local field team has discovered the first progeny of those released animals. Measuring just 5 centimeters in length and weighing just 30 grams, the two babies are believed to be approximately 1 year old. The question now is will they survive. “The Madagascar habitat that is their home is a tough one—there are bush pigs, buzzards, a harsh climate, and poachers to contend with—but they are healthy and strong and we believe they stand a good chance,” Durrell says.